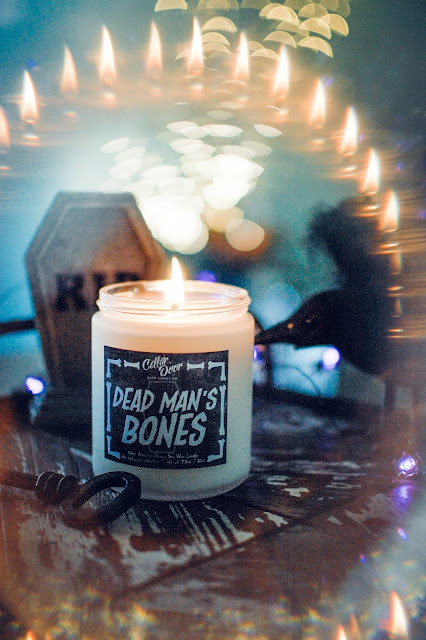 Dead Man's Bones from Cellar Door is the second candle I purchased when I picked up October Road which I reviewed earlier. 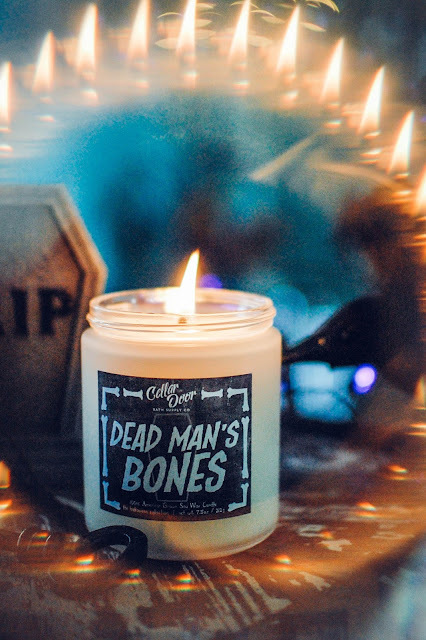 These all soy candles run $18.00 each and arrive in the mail securely packaged and with sample soap slivers (seriously loving the woodsy scent and pumice-like exfoliation of Dapper Dan- I've always been a Dapper Dan man). Back to the candle! 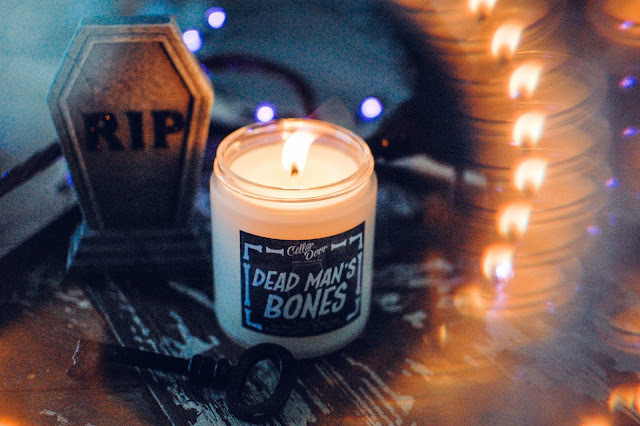 Dead Man's Bones- Notes: Bourbon, mulled cider, dried tobacco, cedarwood. The shambling specter roaming around the local cider mill's vintage cider press. This candle performed nicely in my bedroom on the nightstand. Once it got burning I would enter and leave my room to the faint tang of apples and woods. The cedarwood lends a ghostly purity to the apple corpses that little the cider mill floor. It is a lovely autumnal bedroom scent of apples and woods as though experienced through the layers of time... a little smudged, a little aged and damp. I love it. The throw is medium-light in my bedroom. Strong flame and wick. No tunneling. This one is almost gone I have been burning so much as of late. Not sure what to light up next... what are you burning? Cute, love the label on that one and your little photo set-up. Very evocative. Melting through a mess of Super Tarts clamshells. It turns out I purchased quite a few Fall scents, so tis the season and all that. Thank you! I love the label and the name too. Excellent! Are you having any ST favorites? Mine are almost all melted so come the new year I will be looking to restock. <3 Hope you are loving those fall scents and they aren't giving you any trouble. At the very least, it's been a lot of fun melting through such a variety of scents - everything else I have is quite samey, and this order was not. Cute label! The Jezebel blog just posted requests for readers' favorite candles so I fell down a very deep candle rabbit hole this morning. We're still on the edge of fall here with warm evenings, so I've been burning Yankee Seaside Autumn, which is more fresh/cologne-y, and finishing up Cost Plus Mexican Pumpkin and Indonesian Teak pillars that I've had a while. Both have very light throw, but are fine in my small living room. Excellent! I will pop over and check it out. Which ones made it to your to-buy list? We are still having warm evenings too. By now we should be getting a nice small cold front moving in for a day or two. I hope it comes soon. Hoping your October is going well! <3 Reading anything fun? I need to check out Paddywax! Several smaller, local makers were mentioned as well, which was nice to see. I've only seen Seaside Autumn at Home Goods, so check there if you have one nearby (they had several when I was at my local store last weekend), or TJ Maxx/Marshalls. Just finished listening to The Secret History of Wonder Woman by Jill Lepore which was *fascinating* (tho the author reads it herself & not sure that was the best choice!). I guess it's the basis for the upcoming movie, but from the trailer it seems they may have taken some liberty with the facts. Other than that I've been "comfort reading" with Madeleine L'Engle's Austin family books and a nice, frothy historical romances. What about you? Oooooo! I will have to check that one out! I liked Wrinkle in Time when I read it a couple years ago but I need to read the rest of them. Mmmm... historical romances. My favorite. Feel free to recommend me some. I just finished Lady Macbeth (the actual medieval Scottish story where the play originated from) and liked it a lot. I finished two smaller books by Alice Hoffman, The Green Angel and The Green Witch, loved both! And now I am reading Blood Magic and it is interesting. Very The Craft-ish. I think next I want to read some mystery/historical romance. Gotta browse the bookshelf.